The Kondapalli artisans say there's nothing lucrative to draw younger people and their craft may soon fade away completely. When actor Rajendra Prasad crooned "Konadapalli bomma, Bangaru bomma…" (You Kondapalli toy, you golden toy) to actor Shobhana in Kannayya Kittayya, he was hardly alone in making the comparison. 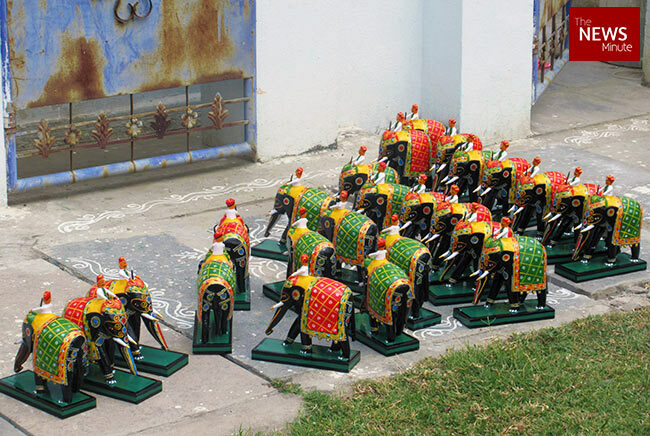 A constant presence in every list of India’s most famous handicrafts, the Kondapalli toys have long served as a gold standard for beauty in the Telugu states. But if things continue as they have, the crafts men and women behind the Kondapalli toys say, these delicate creations may soon turn into a thing of the past. 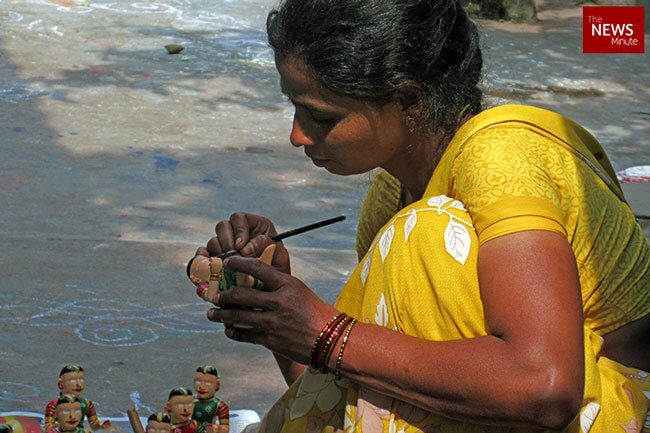 Saleha is one of the 229 master carvers and painters living in the Bommala Colony that was formed in 1987, when former Chief Minister NT Rama Rao provided plots of land for them to set up shop on. 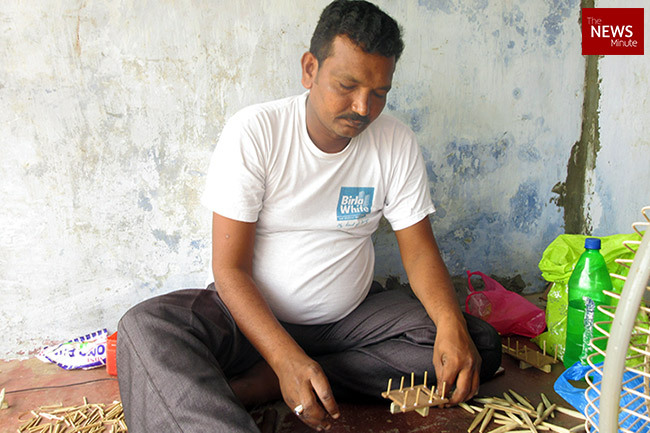 While the rising cost of the raw materials is the toymakers’ most common complaint, their story is also the fate of many other traditional crafts. Though beautiful to look at, the quaint wooden toys are unable to compete with cheaper, flashier modern toys. Their market has gradually eroded as a result, though they maintain a niche in craft fairs and cultural outlets like Shilparamam in Hyderabad. 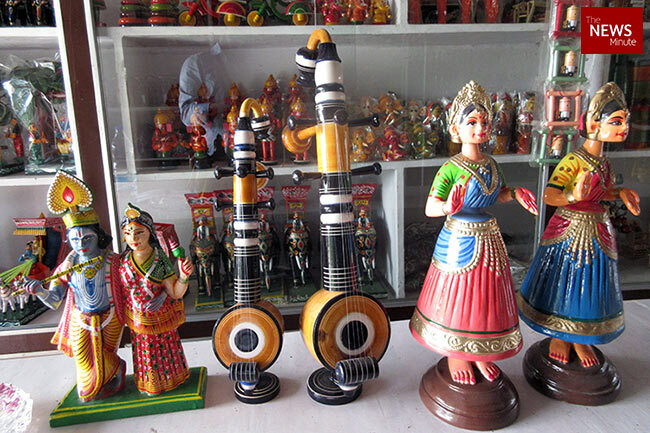 Nestled in the foot of the Eastern Ghats in Andhra’s Krishna district, the village of Kondapalli has been synonymous with its distinctly carved and painted wooden toys since the 16th century. In its heyday, the artists of this village received royal patronage from the Reddy kings who held the Kondapalli fort standing at one end of the village. Their art came to Kondapalli in the 16th century, when some members of the Nakarshalu community from Rajasthan moved here. So impressed was Anavema Reddy, the ruler at the time, that he offered them lavish patronage and asked them to settle in Kondapalli permanently. 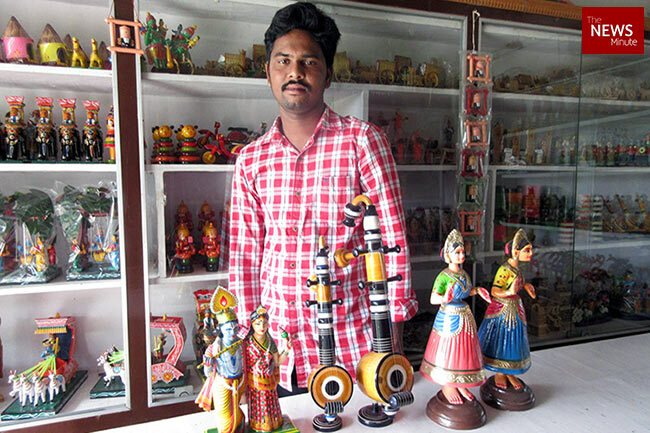 A lot of the market may have fallen out from under the Kondapalli toymakers, but the toys still play a central role in many cultural traditions of the Telugu states. “During Sankranti and Navaratri, the bommala koluvu is very important in some of the major temples such as the Kanaka Durga Temple in Vijayawada and the Mallikarjuna Swamy Temple in Srisailam. Before the holy procession begins, Kondapalli toys are kept for puja,” explains Lalitha. Though there have been attempts to modernise the Kondapalli toys with new designs, the heart of the craft has remained unchanged over years – capturing a graceful portrait of rural life, religion and mythology. “Krishna preaching to Arjuna, the dancing dolls, the Buddha and all our village figurines are what sell best,” says Sathyanarayana, Lalitha’s husband. 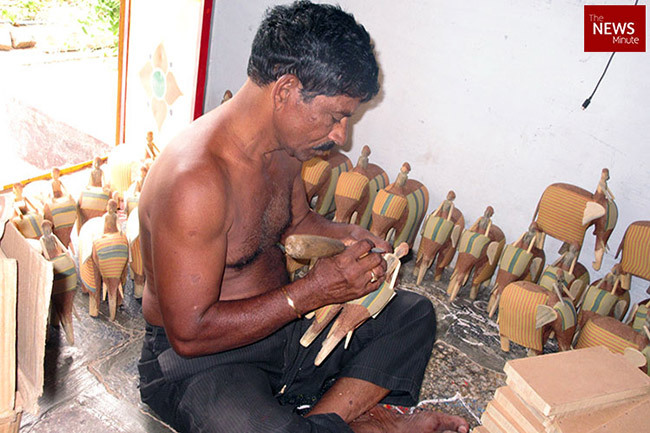 He says that while every toymaker has his own style, one of the most important things about a Kondapalli is the correct expression for each figurine. “For the faces I use people that I see regularly. But we have to know what we want to sculpt. Each figurine – whether a goddess, a soldier, or a child – has a particular expression of its own. If we miss them, we lose the Kondapalli mark,” he says. Another area where many of the most faithful toymakers have refused to compromise is in the painting of the toys. 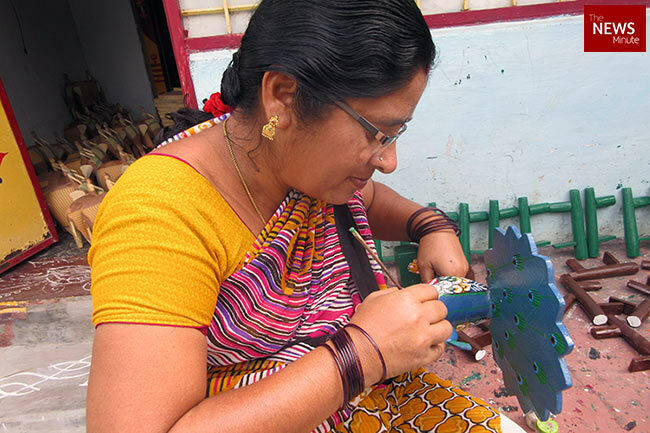 Lalitha explains that while there are a wide range of enamel and vegetable colours available in the market, what marks a genuine Kondapalli toy is the colours made from local trees and plants. “To get the exact colour of skin, we use the modugu puvvu (Butea Monosperma). No another colour can beat it. Unlike chemical colours it looks so beautiful and natural,” explains Lalitha. Similarly, the banthi poovu (marigold) gives them the characteristic organge colour, while the pomegranate fruit gives the green. But holding on to tradition is a desperate battle, especially when government support is lacking, complain the toymakers. 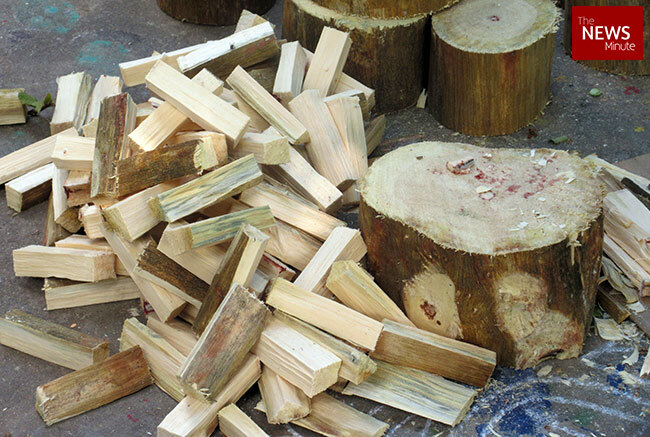 One of the most serious difficulties they face is a shortage of the tella puniki wood that is the lifeblood of the industry. It is this soft, flexible wood that gives the Kondapalli toys their lifelike beauty. But supplies of the wood from the Eastern Ghats are dwindling, and prices rising steeply beyond what the toymakers can afford. “The forests here are done with giving us wood. Now we depend on others to get the wood from nieghbouring areas, which is increasing the cost of production very much," says Sathyanarayana. The rising cost of the tella puniki, which is now priced at Rs 1,000 for a four-foot log, has forced some artisans to forego tradition and find alternative materials for their work. Meanwhile, the artisans themselves say they are ignored and underpaid, ensuring that younger generations have less and less initiative to enter into the profession. Indeed, many of the younger carvers and painters themselves entered the profession because their families required the extra labour to survive. Like 28-year-old Ashok, who dropped out of education after completing his Intermediate, to support his family. "We put a lot of labour into making the toys. It requires so much concentration and skill. But, unfortunately, we are not given as much attention as our toys are," he says. 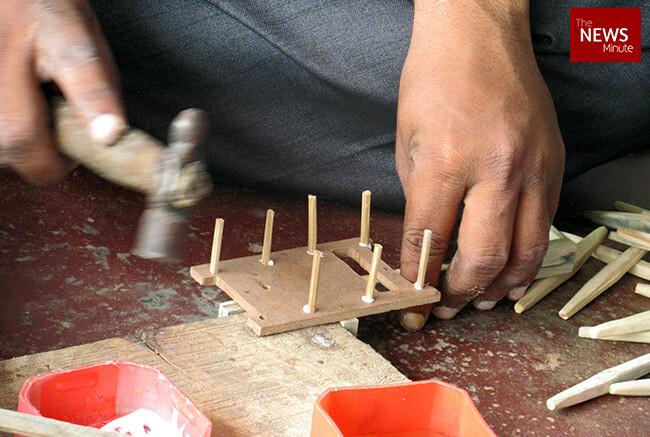 Though toymaking was a lucrative profession in the past, it barely pays a survival wage to many artisans these days, particularly to those who hire out their labour to larger concerns. U Sailaja, who works as a painter, for instance, says, "I get Rs 100 per a day, which is not at all enough. If any one of us doesn't work one day we might not be able to eat that day." For women like Sailaja it's doubly disadvantageous, since the work that remains clearly gender-segregated (with men carving and women painting) always pays the men a little better. Even those who run their own units are struggling to maintain themselves, thanks to the lack of proper channels that help the toys reach those most interested in buying them. Instead, they are forced to sell to middle-men who take away the lion's share of the profits. "Many people buy the toys from us at wholesale rates, and then sell them at government exhibitions, claiming to be 'Kondapalli artisans'. But we small artisans never get the due recognition or proper worth of our work," says Saleha. The government, the artists allege, has no real interest in supporting them and keeping the art alive. "They come to us when it's time to ask for votes, and shower us with promises. But nothing ever comes true. Do they even think of us when they gift Kondapalli toys to some notable figures?" asks Ashok. A new beginning or the end of a tradition? 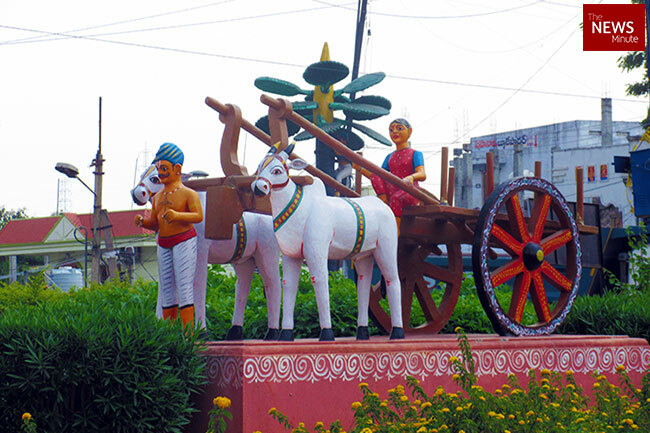 In an attempt to modernise Kondapalli toys, the Andhra government has now hit on the idea of developing new designs that will make the toys movable. Starting with the bullock cart, the government has opened up a call for new designs for the wooden toys, even offering a prize of Rs 2 lakh for the winning design. But the artisans themselves are sceptical about this latest attempt to save their industry. "We have never tried such things earlier. It may be possible, but it will almost surely be very expensive," says Sathyanarayana. A Purnachander, a 26-year-old carver, hits closer home with the concern that this may be leaving behind a centuries-old tradition once and for all. "We can create figurines with a moving outlook, but moving them in real time needs technology. We may be able to do that if we get trained. But will that still be an original Kondapalli doll?" he asks.